Exhibition of work by west-country artists for Porlock Arts Festival and Somerset Art Weeks 2011. Open 11-6 daily. Admission free. Parking in car park. 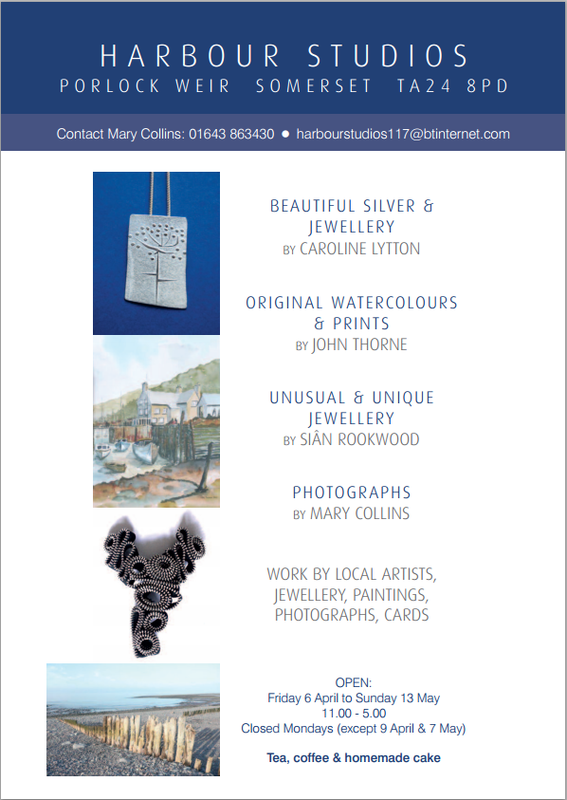 Harbour Studios is again hosting an exceptional exhibition of work for the two art festivals this autumn. Included are two artists from outside Somerset. Merlyn Chesterman is an artist from Hartland. Her wood block prints vary in size from postcard to six foot long, carved from a variety of woods in her tiny Devon studio. They often depict aspects of coast and ocean - her local landscape – and can be understood both literally and on an abstract level. Merlyn is a member of the Devon Guild and teaches extensively; her work is much collected both in England and abroad. Baron Tremain lives in Norfolk but spent many years resident in West Somerset where he worked with many local blacksmiths; in particular on the Sir Winston Churchill memorial gates for the crypt of St Paul’s Cathedral. His forged work is organic and quirky and is created in Wolterton forge on the Walpole estate. He is regularly commissioned for secular or religious work in Norfolk, including Ely Catherdral. Mary Collins is a resident of Porlock Weir and specialises in photos of local scenes and landscapes – lovely reminders of a beautiful place. Larger images are framed and mounted and she has a wide selection of hand-made cards. Mary also ensures that visitors can contemplate, or celebrate, their purchases with delicious cakes – home made in Porlock Weir, and tea or coffee – also supplied in Porlock by Miles tea and coffee. Caroline Lytton makes jewellery in her workshop just within the Exmoor National Park. She trained at the John Cass in London, and has exhibited at Chelsea, Art in Action and with the Somerset Guild in their Somerton gallery. She has always gained inspiration from the natural world: literal images of shells, fossils and leaves to more abstract reflections. Using matt or textured silver with some gold detailing she creates bangles, earrings and rings, necklaces incorporating silver, semi-precious stones and pearls. Small handmade and chased silver bowls and beakers a speciality. One of the Somerset Art Weeks venues, the studio is converted from stables once used for the horses required by the Hotel and the row of historic buildings looks out over the boats in the harbour to the sea and the handsome headland of Hurlstone Point. The studio is part of a group of studios, shops, museums and restaurants clustered at Porlock Weir. Beautiful hand-blown glass, local paintings, luscious hand-picked pashminas, a museum of cherished maritime history and a fascinating aquarium of local fish. Additional to the cakes, teas and coffees at Harbour studios,the wide selection of food outlets at the Weir include the Cafe for all day cakes and refreshments made on the premises, Martin Miller’s Anchor hotel with its unique interior and cinema, a pub, fish and chips or Chinese quisine to take away and ice creams to finish.